The following storys are written by a local Cascabelites and give a little historical background to the community of Cascabel. Down the River at Cascabel AZ. By Guy Gillespie. Cascabel, a bare bones accounting of some significant happenings along the San Pedro River. By Mary Taylor. Cascabel is a place and a community. The place is an area about 40 miles long and ten miles wide along the San Pedro River, beginning about 8 miles north of Benson. There is no post office, no school, no service station, no quick mart and just the beginning of a general store. There is only one road in, through and out of the area with some ranch access roads. The Community is mostly made up of special, different“characters,” independent, but cooperative when needed. Through cooperation and good will they have built a fine Community Center (1989) without government or private loans. Quilt making and raffling, bake sales, donations and other fundraisers along with lots of time, sweat, physical effort and expertise have made the Center a very special place. Historically, the area has a long and interesting background. When early explorers first came, Coronado in 1540 and Father Kino in 1706, they found a lush valley of green grass, running water, cottonwoods, abundant game, fish, and peaceful, farming Indians.By 1865, both Mexican and Anglo settlers had begun to farm in the area, but were driven out by the Apaches who had, by that time, driven out the farming Indians. In 1868, the Leach Wagon Road was built through the area to join military posts to the North and South, and to provide a less hazardous way for travelers going west. The Redfield family settled at Redington in 1875 and were followed by others who found it a great farming and ranching area. Soon there were so many families that a need was felt for a post office, which was established and called Redington. A year later and seven miles south, the Souza family of Tucson settled, created a farm and ranch, built a chapel and school, hired a teacher, and raised 14 children. Life was hard and uncertain. The Bayless family of Tucson came to the Redington area in 1885. One of the descendants, Jack Smallhouse, and his family operate the ranch at this time (1995). In 1887, the year the Apache leader, Geronimo, was captured, a severe earthquake shook the entire area and part of Northern Mexico, causing many changes in stream flow and natural springs.People came and went, population fluctuated. In 1902 the Pool Post Office was established at Mr. Pool’s ranch, but was discontinued in 1913. Alex Herron had a ranch and a small store a short distance north of Hot Springs Wash. In 1916, when he applied for a post office, he wanted to call it Pool,after the former post office. The name was turned down by the authorities. Later, on the way to Benson, Herron met a Mexican with a rattlesnake the man had killed. Herron asked the man the name of the snake and the reply was“Cascabel.” Herron decided to call his post office by that name. The old school at the Soza ranch had been hauled down to a new location just north of the new post office, and another room was added to accommodate the increasing enrollment. The school also served as a community gathering place with box socials and “barn” dances. Many interesting stories are told about those times; in recent years two Pool School reunions have been held at the new Community Center. The school was disbanded and torn down in the 1970’s. A bus comes from Benson now to pick up and return students living in the area. The 20’s and 30’s saw hard times in many places, and Cascabel was no exception. For a while, people came to make a living along the river, with a garden, a few chickens, a goat or cow and wild game. Eventually these folks lost heart and moved back to towns where living was a little easier. By 1936 the Cascabel Post Office was discontinued. World War II caused a further decline in the population. All those work-hardened, ranch-raised boys joined up, saw the world, and decided when they came back that they could do better financially by going to college or working in town. Things were pretty quiet for a while until the late 50’s when electric power was brought in, bringing with it the convenience and luxury of coolers, refrigerators, better lighting and more convenient water pumping equipment. Housewives could even have a washing machine. In the early 60’s the City of Tucson bought the old Pool place and some adjoining land along the river for water rights to the land. Officials had planned to pump water from the San Pedro watershed to Tucson. This was eventually pronounced illegal and the project was abandoned. In 1985 the acreage was sold at auction to developers. This land was divided into irregularly shaped, near 40-acre parcels and put up for sale. Choice lots went rather quickly and new faces were seen on the river, new marks on the land, and more cars on the road. In 1970 a new State road was proposed through the area from Benson to San Manuel, to replace the old 1868 Leach Wagon Road. Surveys were made, some rights of way were purchased, four bridges were built, money was appropriated to finish it,then through some political convolution, the project was abandoned and money diverted to another area. Thus is our condition determined. Our road is called“primitive” (actually, Cascabel Road). Portions of the lower San Pedro River were designated as one of the Last Great Places in1990. The Bureau of Land Management purchased some of the local riparian river bottom acreage to preserve the wildlife habitat and perennial stream. Those who appreciate the unique qualities of the area are pleased that it will not be otherwise exploited. Phones, faxes, and more convenience arrived in 1993, provided by the Midvale Telephone Co. It is a service taken for granted by many, but doubly appreciated by those who had done without for so long. The really interesting history of the area is in the stories of the people. Tales of tragedy abound, along with stories of floods, droughts, illnesses, murders, accidents, feuds, scandals, romances, wild cows, wild rides, screw worms, everyday entertainment, humor, attitudes and ways of doing things. Even today the neighbors tell of the mountain lion that recently held the community hostage for ten days. Sometimes they speak of the little Mexican national boy who became lost and starved to death because he was too afraid to ask for help. It is hoped that folks who have lived here or heard these stories will write them down so they will be preserved, perhaps as an addendum to this manuscript. We moved from Marana, AZ to Cascabel, AZ during the Christmas holidays in 1958. I was a sophomore in High School and would be attending Benson Union High School, twenty five miles from home when school resumed in 1959. We were really out in the boonies! There were only two ranch houses that could be seen from River Road between Pomerene, AZ and our house on the S and J Ranch. Our closest neighbors were Harry and Ethel Smith, a half mile to our North across Kelsey Canyon. Their son, Nolan, was my age and we would be driving to school every day even though neither of us was old enough to get a driver’s license. The Apodaca Ranch was five miles south of us and Frank Williams lived seven miles South of us. Nolan and I were the only two kids from Cascabel going to school in Benson. My little brother would be going to the Poole School, a country school 10 miles north of us. Grades one through eight were taught there by one teacher. Nolan Smith and I carpooled to school in Benson and back every day for two and one half school years. A Police Sergeant would meet us the first day of school when we crossed the San Pedro River bridge into Benson and he would lay out the rules and the route for us to drive to and from school within the city limits. They threatened to make us get on the school bus in Pomerene if we deviated from their suggested route and were caught driving around town. We never had an accident and when we got our drivers’ licenses we finally became “visible” to the Benson Police force. River Road was a “twelve foot wide road” in those days, with no bridges or culverts over the washes and lots more blind curves then today. We seldom met any other vehicles. If you drove the River Road at night you did not see any lights between Pomerene and the Apodaca Ranch house, that was 18 miles.My father, Charles E. Gillespie and Al Simonson purchased the ranch from Frank Williams. My father had the knowledge and Al had the money. The “Ike Russell” Ranch had 29 sections of grazing land, mostly state trust land and a couple of sections of Bureau of Land Management land. There were approximately 1,000 acres of deeded land, mostly along the San Pedro River. Seven sections were on the East side of the river along with the ranch house, barn, equipment shop and the ranch house. There was approximately 150 acres of irrigated land, one irrigation well and the domestic well at the house. We purchased three hundred mother cows, mostly Hereford and Hereford crossbreds, from Frank Williams. We came with four horses and immediately started buying more horses. The grazing land within two miles of the San Pedro River was overgrazed because of the available drinking water in the river. We had five windmills and 12 dirt tanks in washes to catch water for the cattle to drink. The South one third of the ranch on the west side of the river had two roads that went up into the higher country. The rest of the west side of the ranch could only be accessed by foot or on horseback. The terrain was so rough that you could ride a good horse for one day and then needed to rest it for three days. The East side of the ranch could be accessed by driving up Kelsey Canyon in a 4X4 or horseback. There was usually running water at the east end of the ranch property in Kelsey Canyon. There was also an abandoned gold mine and a “line cabin” there. The three biggest problems with cattle ranching at Cascabel were: screw worms, pink eye in Hereford cattle and the drought. Screw worms were the larvae of the screw worm fly. The larvae only ate living flesh. Any scratch, cut, wound or new navel cord was usually attacked within 24 hours with the screw worm fly laying up to 300 eggs. The eggs hatched within 24 hours and the larvae starting consuming their host. The cattle or calves infected had to be roped and doctored as soon as possible. Calves could die within seven days from screw worms entering through their navel cord. Screw worms were a threat in months when it did not freeze, approximately 9 months of the year. We had to practice planned parenthood so the calves would be born in December, January and February or else we had to bring all the cattle down from the mountains to irrigated pasture where we could check the calves daily for screw worm infestation. If a “wet spot” was seen the calves or adult cattle had to be roped, thrown down on the ground and tied, chloroform (Peerless) had to be squirted into the wound to kill the screw worn larvae and then an artificial scab had to be applied, Smear 69, a tar like substance that would cover the wound and keep the adult screw worm flies out. Any scratch or cut on any livestock could result in screw worm infestation nine months of the year. As a result we dehorned all the cattle to help prevent injury from sharp horns when they were fighting. The cut off horn had to be protected with Smear 69 until it healed. Screw worms were eliminated in the 1970s by a Federal government eradication program that went from Florida to California and south to the Panama Canal. Pink eye often resulted in cancer eye or if the eye burst, screw worm infestation and resulting brain damage and death. Pink eye seemed to be more prevalent in cattle with a white face (Hereford) and cattle with pink eye lids (Hereford). White faced cattle that caught pink eye had runny eyes. They had to be restrained, either roped or in a squeeze chute, and the eye doctored with Jensul Powder, Decton Blue powder and some ranchers used liquid black shoe polish. Often nothing helped and the cow lost her eye or developed “cancer eye” and had to be sold at auction for butchering. We begin to purchase Polled Hereford bulls with dark eyelids or dark rings around there eyes to help prevent or reduce pink eye infestations in their calves. Polled meant that the offspring would not grow horns and have to be dehorned. Later on we bought Santa Gertrudis Bulls to get away from white faced calves. Their calves usually had a solid red face and dark eye lids. Drought resulted in overgrazing and lack of feed for the cattle and lack of water for the livestock to drink. From December 1959 through December 1961 we received less than eight inches of rain. All the cattle had to be brought down to irrigated pasture to be kept alive. Al Simonson decided he had enough of drought on the San Pedro River and sold the ranch to Walter Wagner, a horse breeder and sulky racer from Cohoes New York. 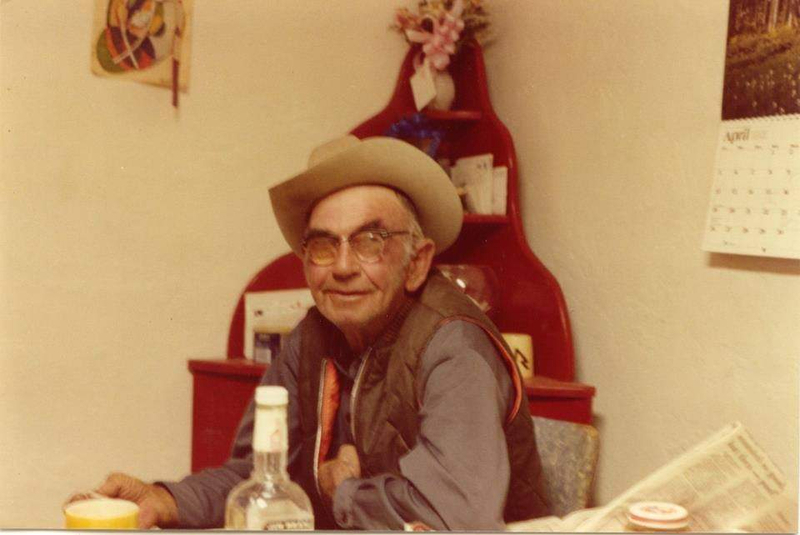 My father stayed on as the ranch manager for the next 25 years. It was an exciting change from growing up in the cotton fields around Marana and Avra Valley in central southern Arizona. We still did a little farming, mostly alfalfa hay and Sudan grass for summer grazing when the cattle were brought down from the mountains. I had to learn how to ride a horse all day long! I learned to rope cattle with a nylon rope. My Father preferred to rope the head so I had to learn to be the “heeler”. He would try to rope the cow by the horns or around the neck if no the cow had been dehorned or was polled and would pull the animal forward while I would rope both hind legs, then we would stretch the cow out and onto the ground. Then the “header” would get off and tie the animal up with a “peggin” string or doctor the cow while I keep the heel rope tight so the cow could not get up. When you let the cow up she usually wanted to fight. It was dangerous work but lots of fun. When I became a better cowboy I often had to ride all day by myself. I would carry two ropes so I could doctor a cow if I found one with screw works or pink eye. I would rope them by the neck. Choke them down, tie them off to a tree or boulder and get a rope on the hind legs and stretch them out so I could doctor them. Turning them loose by myself was often a rodeo and dangerous but still fun. We “tied fast and solid” with a horn loop, no dally roping for us and we used brass hondos on the lasso end so the rope would loosen up easier and not bind up when you were trying to turn a cow loose. Any day that I was not in school was spent on horseback checking stock, riding fence to make sure the fences were up, penning up the neighbors cattle that strayed onto our ranch or rounding up cattle to brand calves or bring home to summer pasture. During the summer rain storms we had to continually ride and check the stock tanks for water catchment and check the fences to make sure they weren’t washed out by flash floods. I had my choice of a dozen well broke horses to ride every day. Some would buck every morning and some wouldn’t. As I got older I started breaking horses to ride and work cattle. Walter Wagner liked to buy horses and thought that he was an expert. The ranchers and cowboys often took advantage of the “Easterner” and sold him horses that had some very bad habits. Colts that really liked to buck were often led by another rider and “snubbed up short” to limit their bucking. Sometimes we would lead them down to the San Pedro River bottom and ride them in the sand and that would limit their bucking. It was also a much nicer place to land if you were bucked off rather than hard ground and prickly pear cactus. You had to ride a colt ten to twenty times before it was “green broke” and you could start to trust it. Then you rode with someone else for six to eight months before the horse could be trusted to be on his own. As the drought progressed we had to start hauling water up into the mountains for the cattle to drink. “Herman” was our water truck. It had a 500 gallon water tank, sucked up its own water from a tank or irrigation ditch. Herman had eight speeds forward and all wheeled drive. Herman also had a winch that could pull 40,000 pounds. I started hauling water when school was out for the summer. I would haul two loads one day and three the next. It would take from six to eight hours a day. Going up a 2,000 foot climb over three miles was very slow. Coming down hill empty was exciting and dangerous. I had one road that took me three hours to drive up to the water storage tank and 15 minutes to come back down empty! No air conditioning and it would really get hot driving that old truck. When I first started hauling water my Father took the driver’s side door off so I could bail out if I lost control coming down the mountain. That really got my attention so I was very careful. Hauling water was a losing proposition so we started clearing deeded land along the river, making fields and drilling irrigation wells so we could bring all the cattle down out of the hills in the summer time. We ended up with almost 2,000 acres of irrigated land while my Father was managing the S & J ranch. When the river would run it would wash out the fences between our ranch and Three Links to the south of us, Harry Smith and Joe Goff to the north of us and everyone’s cattle could get mixed up. We had to gather them up, cut out the ones that were not ours and haul or drive them back to their home ranch. We eventually fenced off both sides of the river and that helped keep our cows home. Sometimes Frank Williams’ cross bred Brahman cattle would tear down the fence on the south end of the ranch on the west side of the river. They were pretty wild and liked to fight a man on a horse sometimes. My Father always had a couple of cow dogs and they would really help gather up the cattle and drive them to the corrals. My Father always said “a good dog was worth a dozen good cowboys” and he moved lots of cattle by himself and those two dogs. In 1959 Manuel Salcido bought the Apodaca Ranch south of us. He sold his ranch up at Mescal and moved all his Brahman cross bred cows down on the river and rebuilt the Apodaca ranch house and moved his family in. Manuel and Mary Louise had five daughters and one son but the children were only down the river when school was out for the summer. During the school months they were boarded with a Chinese family in Benson. It was great to have some girls closer than 25 miles away. Nolan’s cousin, Vonna Bennett, her sister Gaye, little brother Peanut and her mother, Gypsy, moved onto the Bennett place south of us and we had two more girls to admire. During our senior year in Benson Union High School, Dave Williams moved back down the river. Dave, Nolan, Vonna and I carpooled to school. We all had our drivers’ licenses so it was not quite as an adventure as before. David and Vonna got married the summer after we graduated from High School. I graduated from High School in May 1961 and started classes at the University of Arizona that September.. My father had to hire another cowboy. Alphonso “Al” Garcia worked for the S & J for 12 years and ate my Mother’s cooking every day. Al always said that my Mother’s cooking was the best part of the job. Al was a good cowboy but he really wanted to be a driving the tractor and farming. I would come home weekends and usually bring someone who wanted to “cowboy” and we had some great experiences. My little brother, Steven, took my place on the ranch and worked while he was going to High School in Benson and while he was going to the University of Arizona in Tucson. Mr. Wagner eventually purchased Harry Smith’s grazing land leases west and north of the S & J. The 19 sections included five windmills in Paige and Robles canyons and bordered the Bellota A-7 and Buzzard Ranches. The S & J now had approximately 450 head of mother cows and fifty horses, 46 sections of grazing land (29,440 acres) and approximately two thousand acres of irrigated pasture and hay fields. I got married while I was going to the U of A, had two children by the time I graduated and went into the USAF for four years. We would come down and visit at the ranch and help roundup when we could. Walter Wagner sold the S & J Ranch in 1980 or so. My Father and I sold 30 head of horses and my folks moved down to the Elfrieda area to the Chacon Ranch. Many years later my father retired and moved back down the San Pedro River next to Barbara Clark. Some of our neighbors down the river were: Bernardo Bidegan, Lamel Johns and family, Pete Kelly, Bob and Wanda Vanover, Jack and Norma Hughes, Cecil and Ruth Teague, the Harris family (related to the McGeeville), Harry, Ethel and Nolan Smith, Midge Bennett, Cary and Irene Smith, Delbert Miller family, Wilbur Gavin, Butch Harris (Wilcoxx), yRex Ellsworth, Hope Jones. I know I have missed a few. Hope Jones was a middle aged single lady who had a large ranch north of us about 18 miles. She always had a couple of young good looking cowboys working for her. She was rumored to be a “DuPont” and had lots of money. She bought lots of horses and horse feed and turned most of her horses loose to run wild up in the mountains East of the San Pedro River. The Dragoon dances were held in Dragoon AZ in the Womens’ Club building. There might have been six builldings in Dragoon at the time. The dances were held on the the third Saturday night every month. Pug Scott and her band played Bob Wells’ style country swing music. The building held approximately 150 people and three or four hundred might show up for the dance, pay admission and get their hand stamped. No drinking or smoking inside the building so there was always a steady stream of people going in and out. Folding chairs lined the walls and a four by four post was in the middle of the dance floor holding up the roof. People came from miles around to the monthly dances, Wilcox, Elfreida, Bisbee, Douglas, St David, Benson , Pomerene and Tucson were always well represented. My folks, Filbert and Francis Berrera, Bob Fenn and his wife, Manuel and Mary Louise Salcido, Joe and Daisy Mae Cannon rarely missed a Dragoon dance and danced almost every dance all night long. One summer I worked up at Congress Junction and I never missed a dance. We continued going to the Dragoon Dances well into the 1980’s. Law enforcement was never present and the adults kind of policed the lots and kept most of us out of serious trouble. After the dance was over lots of us would go to Benson to the HorseShoe Café for a late night meal. The counter was actually horseshoe shaped in those days. WE always had lots of fun at Dragoon Dances.